Provides pressure relief under the heel, ankle, and lower calf. New longer length (15") for upper-calf skin protection. Made from plush synthetic sheepskin. Large vent holes promote air circulation to reduce perspiration and moisture build-up. Secures with hook-and-loop fastener(s) closures. 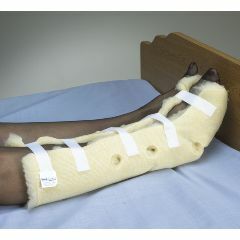 AllegroMedical.com presents The Leg Soft Boot. Provides pressure relief under the heel, ankle, and lower calf. New longer length (15") for upper-calf skin protection. Made from plush synthetic sheepskin. Large vent holes promote air circulation to reduce perspiration and moisture build-up. Secures with hook-and-loop fastener(s) closures. Launderable.